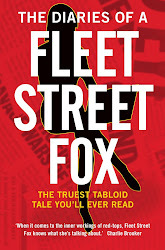 fleet street fox: It's time to put a ferret up them. WITH another injunction ruling yesterday - this one about "office banter" which led to a newspaper hearing about a high-profile affair - it's surely time for Fleet Street to pull its finger out. If anyone Googled the publicly-reported facts of the latest case it would not take long to figure out the identities of those involved. They arguably should be named because the married male star managed to get his female co-star sacked after their affair was over. A cad twice over, and how many office flings end the same way? Despite that three appeal court judges say identities of ill-doers can be kept secret to stop their children being bullied, a precedent which leads in the end to the same protection being afforded to criminals, the corrupt, and all sorts of wrong-uns. As Lord Justice Ward himself said in his ruling: "To restrict publication simply to save the blushes of the famous could have a wholly undesirable, chilling effect on the necessary ability of publishers to sell their newspapers. We have to enable sales if we want to keep our newspapers. Unduly to fetter their freedom... is to undermine the pre-eminence of the deserved place of the Press as a powerful pillar of democracy." Fleet Street exists today only as an idea, but if the industry is to have a future it must uphold the principles on which it relies. All the editors should get together and publish the full list of current injunctions and who's done what to whom. The courts can't send all of us to jail, it just takes a united front and a bit of gumption. Put a ferret up them, as Kelvin would say.